GW is on the brink of new discoveries with the launch of GW’s Center for Biomolecular Sciences (CBMS). Biomolecular research is one of the fundamental pillars of modern biology and medicine, but tiny biomolecules are complex machines difficult to fully understand. The Center’s eight core faculty members hope to better comprehend the structural and functional relationships of biomolecules by combining their cross-disciplinary backgrounds and knowledge into cutting-edge research. The Center’s members share a curiosity and love for biomolecules. The focus of their research is on quantitative sequence-structure-function relationships of biomolecules using diverse theoretical and experimental tools to study broad molecular classes of nucleic acids, proteins, membranes and metabolite. Their diverse backgrounds help them to see different facets of a jointly investigated scientific question. For example, think of the examination of a biomolecule like a doctor ordering multiple diagnostic tests of a person. 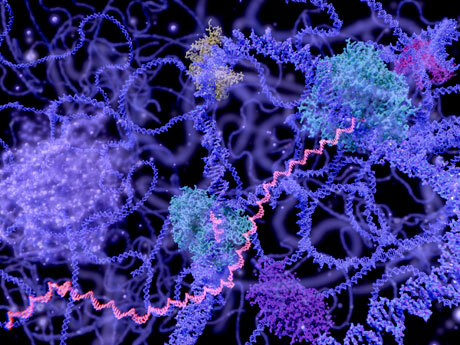 In the case of chromatin, the molecule storing our genome, which looks like “beads-on-a-string,” three of the Center’s members are analyzing it using different tests to gain a more comprehensive understanding. The Peng Lab takes a big data approach to elucidate its variations and disease implications in differentiated and undifferentiated cells. The CBMS’s co-directors, Xiangyun Qiu, assistant professor of physics, and Michael Massiah, associate professor of chemistry, are leading the efforts, with Chen Zeng, professor of physics, as a senior advisor. The eight core members of the new Center are from the physics, chemistry and biology departments, with four more affiliate members from computer science, mechanical engineering and biochemistry. These departments represent three of GW’s schools, namely the Columbian College of Arts & Sciences, The School of Engineering & Applied Science and the School of Medicine & Health Sciences. The researchers will collaborate within the center, as well as with other relevant groups. For example, CBMS will be strategically located at the Virginia Science & Technology Campus to create synergies with GW’s Computational Biology Institute. CBI builds on GW’s strengths in life sciences and computational science to better understand complex biological systems and manage an ever-growing volume of biological information. CBMS is a forum for organizing their research collaborations, as well as working together on joint grant applications, publications, emergent education models and entrepreneurial initiatives. The faculty hope their collaborations will lead to significant new discoveries as their joint research will be greater than the sum of its parts. For more information about the Center, please contact Xiangyun Qiu by email.